Berwick Rangers' second goal against Annan. Berwick boss John Coughlin was delighted with his team’s performance against Annan when the Rangers picked up their first league victory of the season on Saturday. “It wasn’t pretty,” he said, “and after going down to 10 men for most of the second half we had to put in a lot more effort. “The only disappointing thing was that there weren’t more people here to see it. “We were playing our first league game of the season and the crowd wasn’t big, so it is obvious we are going to have to win the fans over with results. “Four points from our opening two games represents a great return for the players. Coughlin insisted if he had one complaint it was that Berwick did not build on their early lead before half-time. He added: “We had a lot more of the ball than Annan and I thought we created a lot more chances, which on another day could have been costly. 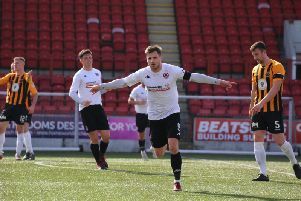 “The sending off (of skipper Jonny Fairbairn) early in the second half could also have had an effect on us, as I was expecting more from Annan and I think their manager (Jim Chapman) will be disappointed at the way they played. “But I have got to give credit to Michael McKenna for the way he took his second goal. “I keep telling him his game needs more goals. He missed the first game at Arbroath because he was suspended, but he showed a lot of determination for his goal, and in general he was busy throughout the match and played a few neat balls through for Jordyn (Sheerin). On Saturday, Berwick will hope to maintain their unbeaten start to their league campaign when they take on Forfar Athletic at Shielfield. But this will be another tough encounter as the Angus side are currently one of only two teams in the division with a 100 per cent record, the other being Elgin City.